In modern Greece, Alexis's father, an extremely wealthy shipping magnate, marries the younger, fiery Phaedra. When Alexis meets his stepmother, sparks fly and the two begin an affair. In 1960, director Jules Dassin and actor Melina Mercouri paired for the successful Never on Sunday. These two united again for another romantic drama via 1962’s Phaedra. Loosely influenced by the work of Euripides, the film introduces us to Phaedra (Mercouri), the daughter of a shipping magnate. She marries her father’s biggest competitor, Thanos Karillas (Raf Villone), and this allows her to live a life of luxury – and boredom, as Phaedra feels unfulfilled. Thanos discovers that his estranged son Alexis (Anthony Perkins) has dropped out of school, so he sends Phaedra to London to retrieve the young man. This takes an unexpected turn when Phaedra falls in love with her stepson and launches into a fateful affair. Given my prior experiences with Dassin’s work, I felt surprised to see him at the head of a drama such as Phaedra. 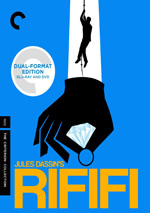 I associate Dassin with crime-related films such as Rififi and Night and the City, not romantic fare such as this. Indeed, without Dassin involved, I wouldn’t have given Phaedra a look. I took interest in the movie solely due to the director’s track record, as the story didn’t sound compelling to me. Alas, my initial instinct proved correct. Even in Dassin’s talented hands, Phaedra becomes a misfire. Some of the problems stem from the casting, as our two leads feel wrong for their roles. With a rather hard-edged, severe appearance, I find to tough to accept Mercouri as the woman all men crave. She lacks classic beauty and could seem borderline unattractive at times, a bad match for a character we’re supposed to accept as some sort of goddess. Even worse, Perkins becomes a terrible match for Alexis. Because he and Phaedra fall in love virtually immediately, we need for Alexis to seem charismatic and dynamic, qualities that Perkins can’t pull off. Indeed, Perkins’ Alexis lacks any compelling qualities whatsoever. Perkins plays the role in a flouncy, goofball manner that makes Alexis seem like a mentally limited nine-year-old, not a talented young man who entices his supposedly beautiful stepmother. Perhaps I’d buy the Alexis/Phaedra romance better if the movie used someone less dynamic than Vallone as Thanos. Handsome, vigorous and magnetic, it seems very tough to accept that Phaedra would prefer simpy Alexis to his dynamic father. Maybe a less charismatic actor would’ve worked better. Or maybe not, as the movie’s problems don’t end with the actors. Phaedra boasts cheesy dialogue that feels like taglines from trailers, and the film tries desperately to create heat and drama. It can’t - it remains goofy and unbelievable at all times. That’s the greatest flaw in Phaedra: it’s just too darned silly. Overwrought and melodramatic, the film fails to create a compelling tale. Phaedra appears in an aspect ratio of approximately 1.66:1 on this Blu-ray Disc. Despite a few exceptions the transfer largely held up well. For the most part, sharpness looked solid. A few slightly soft images materialized, but not a lot. Instead, I thought the majority of the flick boasted nice clarity and delineation. I noticed no issues with jagged edges or shimmering, and edge haloes remained absent. Black levels were pretty strong. At times they could seem a little inky, but usually they presented good depth and dimensionality along with nice contrast. Shadows were also fine. Most of the movie lacked print flaws, but exceptions occurred. The opening credits looked messy, and a few process shots – like Alexis and Phaedra at a museum – could be problematic. Otherwise, defects stayed minor. I saw a smattering of small marks but nothing substantial beyond the scenes I mentioned. In the end, the transfer was a little inconsistent but it mostly looked good. Phaedra featured a perfectly adequate DTS-HD MA monaural sound mix, one that seemed typical of efforts from the era. Effects were somewhat dull and lacked detail, but I found them to also be clear and without obvious problems. Music failed to provide much punch, as dynamic range appeared limited. Speech was a little flat – and held back by a lot of lackluster looping – but seemed intelligible and without edginess. The soundtrack delivered little spark or life, but it's acceptable based on the age of the movie. Based on the director’s track record, I hoped to like Phaedra. Unfortunately, Jules Dassin’s talents fail him here, as the movie lacks insight or drama. The Blu-ray presents mostly good picture along with adequate audio and no substantial supplements. Phaedra becomes a flawed disappointment.